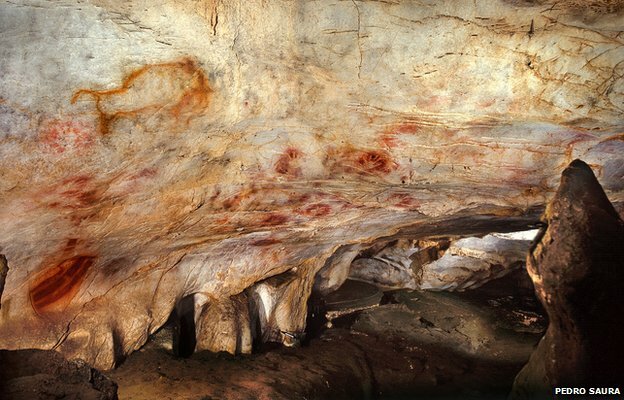 One motif – a faint red dot – is said to be more than 40,000 years old…. The oldest dates coincide with the first known immigration into Europe of modern humans (Homo sapiens). Before about 41,000 years ago, it is their evolutionary cousins, the Neanderthals (Homo neanderthalensis), who dominate the continent. Dr Pike’s and colleagues’ work therefore raises some intriguing questions about who might have authored the markings. If anatomically modern humans were responsible then it means they engaged in the activity almost immediately on their arrival in Europe. If Neanderthals were the artisans, it adds another layer to our understanding of their capabilities and sophistication.